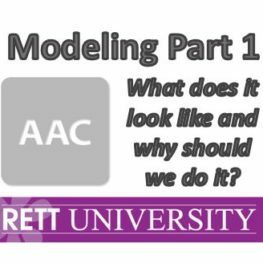 This recorded webinar will advance the idea of how essential modeling is for the learning of communication for AAC users. It is essential that students develop strong communication skills as it is one of the key skill sets that allow students to move from emergent to conventional readers and writers. Soft-tech and high-tech options will be modeled for the beginning communicator. Participants will view videos that demonstrate how to model using our Rett-U 4-Grid FlipBook as well as paper grids that can be placed around the house. For those beginning on an eye gaze device, the “Pati/Judy” pages and SonoPrimo will be modeled. All the modeling will be embedded into the three avenues for language development. Resources will include research articles on the importance of modeling to share with your kiddo’s school and private teams and PDF page-grids for soft-tech modeling in everyday activities.